His Wakefield side were among the big winners in round 10, along with St Helens, the two Hull clubs - FC and KR - Huddersfield and Leeds. Here are the highlights from the latest round, picked by the Super League Man of Steel panel, led by three-time winner Ellery Hanley. 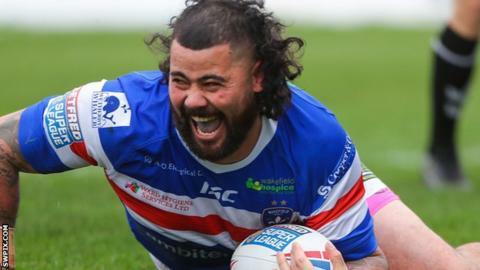 Prop Fifita's unstoppable form continued with a stellar display against the reigning champions Wigan. He created a try for Max Jowitt with a thunderous break off the restart and played 80 minutes, amassing 168 metres, 29 tackles and seven tackle busts. Such a formidable platform allowed Danny Brough to dictate play behind him, with eight attacking kicks and five goals. Oliver Gildart was Wigan's star, creating tries for Joe Burgess down the left edge, and continuing his impressive 2019 form. Jonny Lomax helped St Helens show their title credentials even at this relatively early stage as they put fellow pacesetters Warrington Wolves to the sword in convincing fashion. The stand-off guided Saints around the park, ably assisted by full-back Lachlan Coote and on the back of an immense platform laid by forwards such as Alex Walmsley. It ended a procession of maximum-point scores enjoyed by Wolves half Blake Austin, and also saw the Australian unseated at the top of the leaderboard. Marc Sneyd is among Super League's most prolific kickers, missing just a quarter of his shots at goal in the division this season. His unerring boot was Hull's most productive weapon in a crazy game, in particular slotting a penalty from half-way to level, then securing a scrum on the back of a perfectly-taken restart and dropping the goal which won it. Defeat was harsh on Sam Kasiano, who was a behemoth in the Dragons' front row, while Josh Griffin continued his impressive try-scoring to move joint-third on the marksmen's leaderboard. With a split round required for the Challenge Cup fifth round, it was a case of back to the archive for the Steve Prescott Man of Steel judges. Evergreen playmaker Danny McGuire was the main man as Rovers continued their bright start to the season back in February, with cannonball centre Junior Vaivai also picking up points. Former Hull FC half Jordan Abdull was at the heart of London's best work, but finished on the losing side despite picking up a point. Alex Mellor delivered a match-winning trio of tries for Huddersfield Giants to steer them to a narrow victory against Castleford. However, the former Bradford back-rower was only awarded the two MoS points, as fellow forward Ukuma Ta'ai was given the maximum after churning through his duties. Liam Watts continued the form which has seen his name mentioned in terms of international recognition as the Tigers' stand-out performer. Leeds ensured two points were theirs for the first time in 2019 when they came up against Salford, as a flurry of tries put them in the driving seat following Jansin Turgut's sin-binning. Jack Walker was immense, the diminutive full-back belying his size to have a major impact, while Manchester-born Kallum Watkins showed Leeds fans what they had missed during his absence through injury last term. Australian half-back Jackson Hastings, so often Salford's most potent threat, collected a point for his contribution.